Looking for a Tripwire® alternative? Tired of the endless noise of change, high operating costs, continuous support issues, scalability limitations and the general complexity of managing a Tripwire® installation? Let NNT show you our SecureOps™ strategy and how we have become the leader in Security Through System Integrity. Whether you’re considering a new deployment or replacing an existing Tripwire® implementation, NNT’s software platform is a modern framework built to meet the needs and requirements of the largest and most demanding environments. Just ask any one of the hundreds that have become NNT customers! The differences between Tripwire® and NNT are quite stark. NNT has a much better reputation, product, cost, flexibility, and ease of scalability. We've achieved more in three months with NNT than we achieved with Tripwire® in over three years. There's simply no comparison. Based on a recommendation from our Sister Company, JetBlue, we decided to look at NNT as a possible alternative to Tripwire®. As a result, we now have a solution that ticks all the boxes, is much easier to use, and way less expensive. NNT offered us a solution and price that was hard to ignore. The combination of excellent software and their super support has allowed us to implement a solution that saves us thousands of dollars in annual running costs compared to Tripwire®. Why tolerate Tripwire®’s change noise. NNT’s unique intelligent change control technology is proven to reduce change noise as much as 99%. Paying too much for Tripwire®? On average customers that switch to NNT reduce costs by 70% over a three year period. NNT’s modern, componentized architecture can support at a minimum 10 times more devices with a single console than Tripwire®. Tripwire® product to orchestrate and manage multiple consoles was recently canceled in favor of requiring a third-party developed tool. NNT has integrated into the workflows of leading ITSM vendors to create a closed-loop intelligent change control process that highlights planned vs unplanned change. NNT has a white-list database service called FAST Cloud that can validate and verify the integrity and authenticity of files as changes are being detected in real-time. 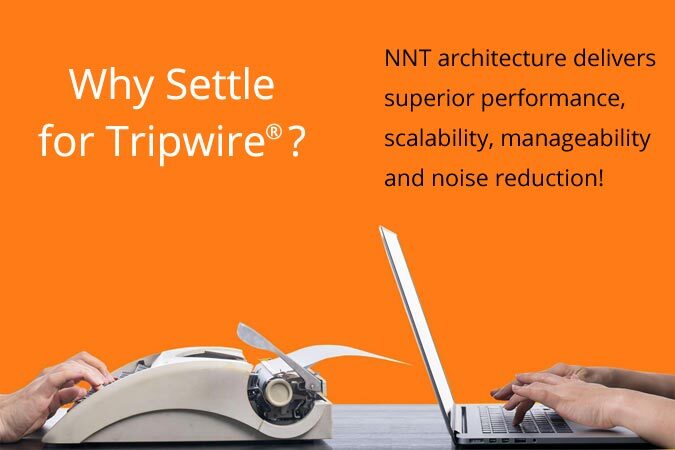 Tripwire® Enterprise almost always requires professional services for deployment and training is highly recommended whereas NNT is significantly easier and far more intuitive to install and operate. NNT’s console is included at no additional cost and can be installed on a free operating system such as CentOS with a MongoDB included. Tripwire® requires a server class operating system to run the console and the database requires MySQL Professional/Enterprise or Oracle. NNT Change Tracker requires approximately half of the system resource requirements for comparable installations as that of Tripwire® Enterprise. With the frequent updates to Java, Tripwire® customers are left with the headaches and hassles of managing countless patches and updates. More disruption and uncertainty for Tripwire® customers as company is acquired by Belden - So what is the best Tripwire alternative available? The views and opinions expressed below are exclusively those of New Net Technologies (NNT), and are not provided or endorsed by Tripwire Inc. This page is designed for anyone researching market options. The information on this page is provided solely for research relating to any potential purchase of NNT software. Tripwire® is a trademark of Tripwire Inc.